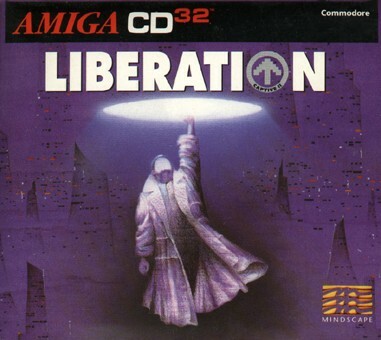 Liberation is a followup to a sci-fi RPG released on A500, but i have never played it. 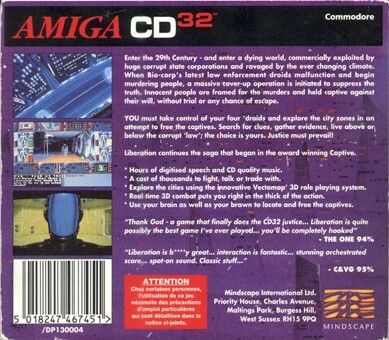 Liberation is a great upgrade and utilizes both CD32 and expansion, CD32 pad, Keyboard and Mouse. Also Fast RAM and accelerator if you have that. In this game you can walk or ride car around the a large city which is splitted into smaller parts, but they are also large. You can walk into all bulidings and talk to people and search for things. If you kill people you will get the police after you some of them can be hard to get rid off. You can upgrade your cyborg with new technology and this can sometimes be advanced because there so much possibilities.